John Donovan is originally from Chicago, Illinois and used to instruct and later supervise Golden Peak Childrens Ski School, ages 7-teen. 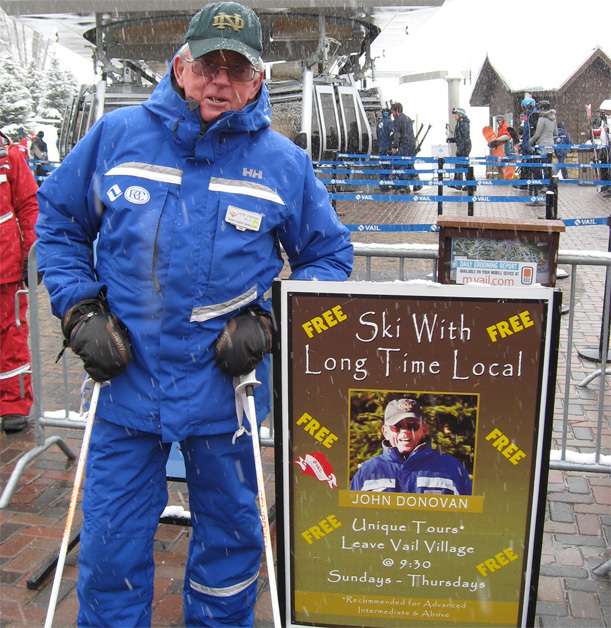 Now he leads ski tours of Vail Mountain five days a week. Q: How long have you been an instructor? A: I have been in Vail since 1963. I read about Vail in Sports Illustrated in October of 1962. I had friends who worked in Denver so I came straight here. I ran the Golden Peak Children’s Ski School for about fifteen years, and that was the highlight of my teaching career. I invented the “Ski with a Local” tour 35 years ago and as a result I end up talking to people from all over the world. (Tours leave at 10am from Gondola One Saturday through Wednesday). Q: What did you do before you were a ski instructor? A: I worked at the Vail Village Inn washing dishes and then I opened up the Vail Deli with my business partner Phil Lamenti. I went on to open up Donovan’s Copper Bar (now Vendettas). Ski patrollers have been getting free beers here for over fifty years. I also started the Vail Honeywagon, which is a trash collection service here in town. My son Matt now runs it. And my daughter Kerry is a Colorado state senator. Q: What do you do in the summer? A: I have a 400-acre ranch in West Squaw Creek with cattle, horses, mules, and chickens. I look after them and the property during the summer. Q: Do you speak any other languages? A: I barely speak English! Q: Why did you choose to teach at Vail as opposed to somewhere else? A: I didn’t choose to teach at Vail, I chose Vail. The teaching came along second. At the time skiing wasn’t very big in this country. But they had big plans in Vail. My deli was the fifth business in town when we opened it. I didn’t choose to teach in Vail; I’ve been here all along. Q: What is the most inspiring moment you’ve had while teaching? A: I skied with President Ford. He liked Hunky Dory and Sourdough Express, because he could take a whole run in one shot. With Secret Service everywhere, it was quite the scene. Q: What is the best part of teaching? A: Best part about teaching is cutting lift lines. Q: What is the most interesting place a student has been from? A: Most interesting place someone has been from: Portugal, Brazil, Argentina. The finest students are from Australia. I may go down and see them this summer. Australia has good people! Q: What is your most memorable lesson or day? A: One April Fools Day I went up to the Ski Patrol Headquarters with two other supervisors and the other two put on patrol jackets and then put me in the toboggan as a “victim.” When we got down to Mid-Vail under the chair lift I would stand up, they would punch me back down, and off we’d go again. Q: What is one tip you would give to all skiers? A: If you’re not enjoying the day then you’re doing something wrong. Q: What is your perfect day at Vail? A: My perfect day comes every year on March 17: St Patrick’s Day. When they used to let us have fun in Vail, we played baseball (on skis) and drank. We played at Mid-Vail. I used to play and then I refereed it. Q: What is your favorite run? A: I do like Blue Sky Basin: Grand Review and Big Rock Park. Q: What is one insight you can provide to how Vail has changed over the years? A: Well for one, it’s gotten a lot bigger. There used to be no Game Creek. In 1966 I found the Lost Boy. Back when Game Creek Bowl was out of bounds, there was a teenager—I remember he was from Illinois—who tried to go to Minturn but lost his way down in Game Creek. We had 30-40 people out looking for him, but by nightfall we still hadn’t found him. The next morning as we went up Chair 3, he started walking right at us, just walking out of Game Creek. I remember saying “there’s the lost boy” and it just stuck. Q: What is your favorite Ski and Snowboard School lesson to teach? I always liked the private lessons because it gave you a chance to get to know the kids better.